There has been an increased media focus in recent months on the rising cost of college tuition and the associated growth in student loan balances. In general, there is a sense that graduating college students are being saddled with so much debt that it will inhibit their ability to live as well as their parents or grandparents have lived. From a macroeconomic standpoint, the massive debt burden facing “Millennials” could potentially become a very big impediment to growth over the next decade. The worry is that heavily indebted graduates will have less access to credit, spend less, save less, defer home purchases, and slow new household formation. None of this is good for an economy that depends heavily on consumer spending. Before we get into the numbers, let’s define consumer credit. 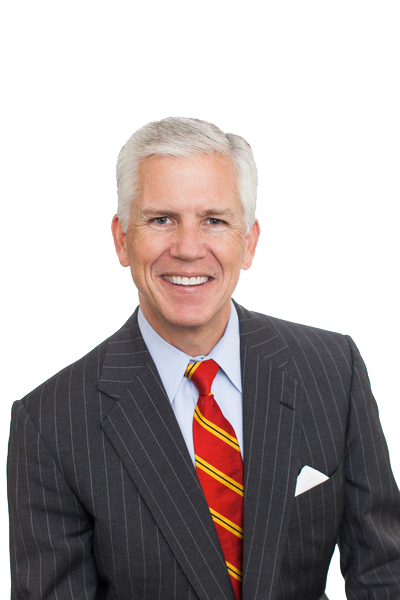 According to the Federal Reserve’s web site, total consumer credit consists of “outstanding credit extended to individuals for household, family, and other personal expenditures, excluding loans secured by real estate.” So for purposes of this analysis, we are not considering mortgage debt, home equity loans, or HELOCs. For our purposes, you can think of consumer credit as the sum of all credit card loans, motor vehicle loans, education loans, boat loans and recreational vehicle loans. (There are some other minor contributors to consumer credit, but these categories cover the large majority). Now, data on the Fed’s web site tell us that total consumer credit increased by about $482 billion from $2.6 trillion at the start of the Great Recession in December, 2007, to $3.1 trillion at the end of 2013. Over this same period, student loans outstanding essentially doubled from $634 billion to $1.2 trillion. Therefore, the growth in student loans exceeded the growth in total consumer credit since the recession began. Said another way, consumer credit outstanding actually decreased from the end of 2007 to the end of 2013 if we exclude student loans from the calculation. Strikingly, student loans outstanding have gone from representing just 24% of total consumer credit to 40% of total consumer credit over a period of just six years. The chart below depicts the cumulative changes in 1) total consumer credit, 2) student loans, and 3) total consumer credit less student loans. The first thing you may notice is that student loan balances experienced uninterrupted growth throughout the most serious recession in decades right on through today. This is represented by the pink line. The blue line shows that total consumer credit, which includes student loans, declined for a period in the years 2009 and 2010 before resuming a growth trajectory. This should not be totally unexpected given the severity of the recession. 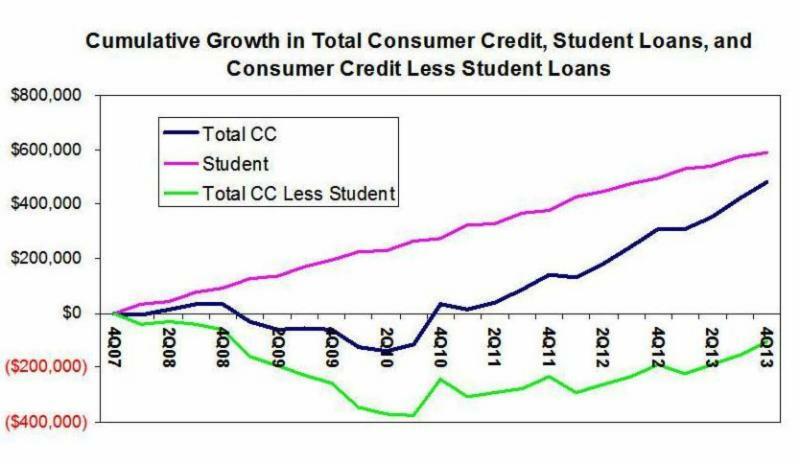 However, the green line shows that if we exclude student loans, consumer credit has still not recovered to the levels prior to the recession. This is pretty stunning given we are in the fifth year of the recovery. While consumer credit has resumed a normal trajectory (ie, loan categories other than student loans are growing again), we remain concerned about both the recovery’s dependence on student borrowing as well as the longer-term effects of so much student debt. The drag created by such big amounts of student debt is likely to reverberate throughout the economy for many years to come. This is just another reason we expect to remain stuck in a long period of sub-par economic growth.